PROPERTIES AND APPEARANCE: White powder,insoluble in water,soluble in hot and concentrated strong acid and alkali,having the good chemical stability;It has strong achromatic power,covering power,with excellent properties of pigment. MAIN APPLICATIONS: widely uesed in painting,printing oil,paper making,plastic,ribber,artificial fiber,welding electric,enamel,electric appliances and construction material etc. 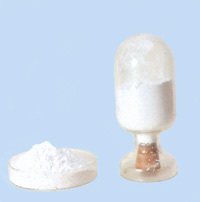 Content of TiO2 %(m/m):98% Min. PROPERTIES AND APPEARANCE:White powder, insoluble in water, non-toxic,chemically extremely stable, surface treated with silicon,aluminum compounds and modified with organic compounds, it has excellent pigment properties, such as high whiteness, gloss, hiding ower,tint reducing power and dispersibility, excellent weathering resistance and chalking esistance. MAIN APPLICATIONS:it is widely used aqueous and solvent-based exterior paints, electro-deposition paints, plastics, rubber,printing ink, high quality paper, waxed paper and leather finishes, cosmetics etc. PACKING:Kraft paper bag lined with plastic film,net weight 25kgs. Tint reducing power European unit :165Min. 105C Moisture % : 0.75Max.